VIDEO: Now CNN says the Clinton Foundation Scandal "isn't going away"
Thanks for all who came to our 10th Annual Reed Irvine Awards, held at the Capitol Hill Club in Washington, D.C. this past Tuesday evening. A great time was had by all! 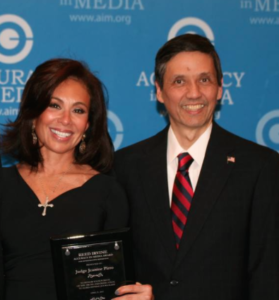 Fox News’ Jeanine Pirro blew away the crowd and graciously accepted her Reed Irvine Award! 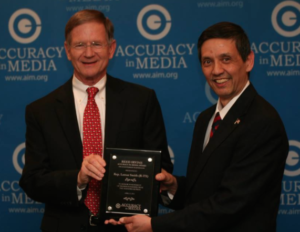 We can’t forget Texas Congressman and longtime friend of AIM Lamar Smith, who spent time out of his busy schedule to come and accept his award before heading back to the Hill for a vote! 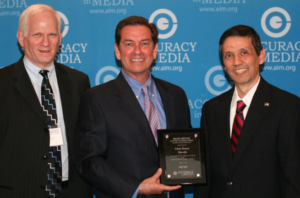 WMAL radio talk show host Chris Plante’s remarks were unforgettable and showed why he is beloved in the D.C. area.